This article presents practical strategies and ideas for the person who is serious about finding ways to improve posture and feel better. 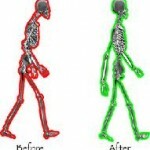 Using just a few of the wide variety of interesting and helpful suggestions to improve posture on a frequent basis will improve your standing and sitting posture, and you will feel better and younger because your energy will not be wasted on bad posture. You will find mostly new and several tried and true ways of to protect your spinal alignment as you do postural exercises. Your back and neck will feel less tense and sore, and you will enjoy of greater range of pain-free movement because that is what good posture gives to you. The information in this list is presented in random order because I want you to be exposed to many different ideas before you decide which ones you will actually use to improve posture and reduce back pain. Many people will note that one or two ideas are exactly what they need to address the primary problem they do not have perfect posture. You are guaranteed to see more than a few suggestions that will apply to you specifically. Use those ideas and leave the rest to try later. Do not try to do too many different things at one time, because you will overload yourself and fail. Make a firm commitment to work with just one or two ideal suggestions; incorporate them into your daily routine to begin the process of improving posture on a daily basis. Not all of this information is appropriate for every person; you must read through the list for those ideas that apply to what you know is wrong, so feel free to pick and choose. Correct just one bad habit this week with a new of taking care of yourself and in just a few weeks, with minimal effort, you will have started to forever change your life and how you feel. 1. Shoulder roll. To reduce the feeling of tension and stress in the upper back and base of the skull, move the shoulders through an exaggerated range of motion periodically, especially when you feel tight and irritable. Slowly and carefully push your shoulders forward and toward each other so you feel the chest forming a large cavity. While still pressed inward, now bring both shoulders straight up, then force them down firmly, and finally press both shoulders straight back so the chest is puffed out proudly. Repeat this slowly several times. You will probably feel and hear some popping sounds as small joints of the shoulder girdle open and stretch for the first time in a long while – this is good. Now your upper back and neck are more relaxed and receptive to making good posture changes. 2. Posture shirt. If your posture is especially bad, ask your doctor to prescribe a special shirt designed to aid posture. These shirts are designed to train and strengthen back, chest and upper body muscles to maintain proper posture while you are wearing it. Soon you will not need the shirt because improved posture will become natural without it. 3. Open up to relax. Too many hours at a computer leads to being hunched forward with the head held away from the chest and the shoulder coming together in front. To reverse this habit, stretch and open up our entire body to improve the range of motion of the upper body. For five minutes every hour stand up and stretch, walk, or stand up and look out the window to change the focus of the eyes. 4. When does it hurt? Learn the early warning signs of pain and discomfort your body gives you when you are using bad posture habits or poor ergonomics. Back pain, neck pain, headaches, tension at the base of the skill may be caused by the stress of poor ergonomics and poor posture. If you feel worse or have these painful signs only at certain times of day or days of the week, or under certain circumstances (such as only when working on the computer, but not the weekends, or only when you sit in your car, but not your sofa), use this information to isolate the ergonomic problem. It might be time to get a new chair or to use cushions to provide the support you need for good posture habits. 5. Do not walk so heavy. Some people tend to walk heavily and strike the heel of the foot hard with each step they take. Lighten up the way your heel hits the ground as you walk. Try focusing on your calf muscles at the back of your lower legs, and feel how springy you can make them each time you step forward. Allow the way you walk and move forward, and balance yourself, to come more from the calves. Allow yourself to feel more relaxed and at ease as you walk. Allow your arms to hang looser as you walk, and perhaps even swing a bit father forward as you walk. Allow yourself to feel at balanced and comfortable as you walk, with a natural bounce and lightness with each step you take. 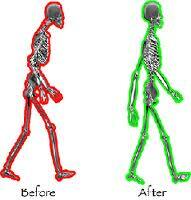 Soon you will notice less tension and force when you walk, and more relaxed throughout the body. 6. Menopause and the spine. Support the spine especially after menopause when women often experience more weakening of the spinal muscles than men of the same age. Do exercises that target all flexor and extensor muscles of the back and neck, as well as rotator and lateral flexor muscles when using floor exercises or machines. When all else fails, go for a long walk to tone all the muscles of your body. 7. Lighten up a bit. Whenever possible, avoid carrying heavy items. If you feel the load might be a bit more than you can handle, lifting and holding too much is bad for the shoulders and back, and stresses posture. Get some help or divide the load into smaller units. Use a back pack that uses a different set of muscles and avoids fatiguing the shoulder and arm muscles. Get a roller bag you can push – not pull – to move heavy weights for long distances. Switch hands often to avoid overusing one half of the body. 8. Good posture and movement. Maintain good posture especially while moving to avoid injury because this is when joints are most vulnerable and muscles are working the hardest. Walking, twisting while lifting heavy materials, bending forward at the waist, or even something as simple and light as holding a telephone to the ear or working at the computer, all require attention to ergonomics and posture. Back injuries are common while lifting and twisting because of awkward movement, faulty body mechanics and the poor posture that is used while doing them, rather than the weight that is involved. 9. Eat better. Calcium benefits bones and muscle tissue, as does vitamin D. Protein is essential for repair and maintenance of muscles that are stressed during a busy day. Posture depends on a good diet, so if you know yours is lacking, this is a good place to make some changes too. 10. Get a good quality chair. For both work and for relaxing at home, a well designed chair is essential. It should be high enough that the feet rest on the floor, have a sufficiently firm and comfortable base that is deep enough to support the thighs well, allows the knees to be held slightly higher than the hips, conforms to curve of the low back, and is high enough that the upper back is supported. If your chair does not fit this description it is probably making your back tired and contributing to your postural alignment problem. 11. Say “Om.” Find a Hatha yoga teacher who has experience and interest in working with people who want to have better posture. Yoga will help with greater body awareness, development of core strength, and improved flexibility and strength throughout the body. Start gradually and be aware of how your body responds. 12. Eliminate bad habits that promote bad posture. Reading in bed, holding the telephone tucked between the raised shoulder and the ear, using too many pillows that bend the neck so the chin is on the chest all night long, sleeping on your tummy with the head turned 90 degrees all night long, sitting at the computer while placing most of your upper body weight on one elbow – all promote poor posture. 13. Invest in sleep time. Purchase a good quality bed and pillow that are more firm than they are soft. While a soft mattress and pillow allows you to sink down into them might feel initially comfortable, when used all night long this softness will lead to neck and back problems. You must be able to move around while you sleep, and a firm mattress permits this movement and a soft one does not. Consider a foam material orthopedic pillow that come in slightly different designs, but all support the natural neck curves nicely. 14. Stand softly. If you stand all day long, invest in a rubber mat made just for this purpose. Buy the best pair of shoes you can afford from a store that caters to people with problem feet and poor posture. They will know how to guide you for more comfortable standing. 15. Prop yourself up to relax muscles and ease tension. Use posture supporting props and ergonomic office chairs when sitting, and even small simple pillows in bed under arms and legs to get a better night’s sleep. Ergonomic office chairs with adjustable arm rests and back supports, and moveable back cushions, are great at work. A small box or thick book can be used as a footrest to reduce low back stress, as can a rolled towel or small pillow placed strategically along the spine. For long trips in the car a purse, bag, coat, backpack or small pillow can minimize back fatigue and promote improved posture changes. 16. New glasses at the computer. For less neck tightness and fewer headaches try a new eyeglass prescription. Reduce eye strain my repositioning the computer screen so the head is held level, and you are not tipping your head up or down. Better head position and less eye strain will ease the tension in the neck and upper back, and make upper back posture better. 17. Talk to a professional. For those with really bad posture or a history of back injuries or serious back pain, consult with a chiropractor or physical therapist to assess special exercise needs and specific ideas for your unique problems. 18. Don’t give up. Persistence will always pay off. If you have structural changes in the bone and soft tissue where you have bad posture, large posture improvement might not be possible. However, even small changes in body carriage can be rewarded with large improvement in how you feel; sometimes a small improvement of posture can reduce a great amount of back pain and stiffness. Any change you make with your body mechanics and alignment can pay rewards far greater than the effort to make them. Good luck to you in your effort to get improved posture and reverse many of the reasons you have low back pain and headaches, and not as much energy as you once did. For more information and help to stand taller and feel better with good posture, click here: Doctor’s 21 tips to improve posture and relieve back pain now.